Stacy Horn » Blog Archive » Spiders or Flying Roaches? The other night, a daddy long legs woke me up as he crawled over me. I jumped up, but I didn’t have the heart to kill him. I just watched him as he walked away. 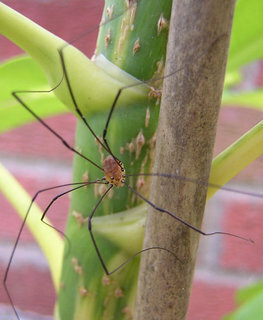 I hate hate hate spiders, even ones as benign as daddy long legs. But I think I hate flying roaches more. I was going to put up a picture of one but I hate them so much I couldn’t even deal with a picture of one on my blog. People who have never seen them flying don’t believe they exist, but I found the description below. Note the part that says they look identical to other cockroaches. That is the most diabolical thing about them. They look like regular, big old waterbug type cockroaches, but when you get up to get rid of them they fly off the wall and RIGHT INTO YOUR FACE. Right. So, I’m trying to decide, which are worse? Spiders or flying roaches?